Nine bands will join the Raglan Road troupe of Irish dancers to offer guests non-stop entertainment during this annual celebration. Families can enjoy the festival-esque atmosphere, dancers will invite kids onstage for a dance lesson, and those looking for late-night fun can grab a seat and enjoy an Irish rock show from the Young Dubliners. “We’ll also mix it up with some unique musical collaborations by our in-house artists,” said Raglan Road co-owner John Cooke. On March 17, St. Patrick’s Day, guests will be seated on a first-come, first-served basis with a $10 cover charge for each guest age 18 and older. Reservations can be booked for the other festival days with no cover by calling (407) 938-0300. Guests can enjoy a wide selection of beers, whiskeys, and craft cocktails alongside pug grub and more Irish fare while musicians perform on multiple stages indoors and out. Performances will run from 3 p.m. – 1:30 a.m. on March 15, and from 11 a.m. – 1:30 a.m. on March 16-17. The pub will open for seating at 9 a.m. on Saturday and Sunday. Mighty Festival guests can add to their Irish attire with complimentary face painting from 3-9 p.m. on March 15 and 10 a.m. – 8 p.m. on March 16-17. 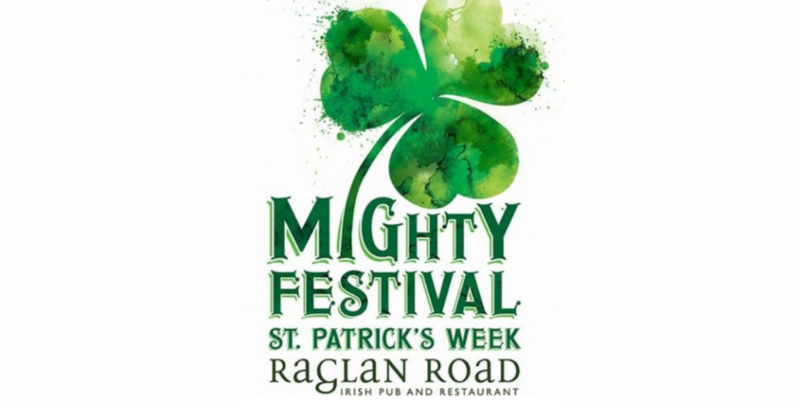 To learn more about this year’s event, visit RaglanRoad.com.